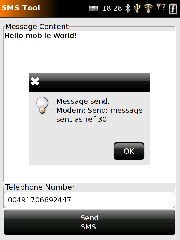 SMSTool is an old program which can send SMS messages. It cannot receive messages. This programm is written in Python using pygtk. It can be used only if those are present in your environment. As there are no gsmd python bindings available at the time, SMSTool uses python-subprocess and threads to communicate to the commandline of libgsmd-tool for the time being. An SMSTool package is available from the repository at Alessandro's user page. If you want to test this and do not have a build environment, you can 'ipkg install' the python components from the ScaredyCat repositories. This page was last modified on 20 April 2010, at 09:09. This page has been accessed 25,118 times.